Hope everyone had a great Labor Day/Hari Raya/Merdeka Day weekend! This was supposed to be a Market Monday post, but SOK took the day off, too. I’ve been in Hawaii for the past week, so I visited one of my favorite farmers’ markets at the Kapiolani Community College. It’s become something of a tourist draw since I first started visiting — the number of buses disgorging Japanese sightseers is a bit disconcerting — but it’s still a great place to find unusual local products, like…sea asparagus. Not to be confused with the shellfish of the same name, sea asparagus is a kind of saltwater vegetable that’s now being cultivated in Hawaii. It doesn’t look or taste much like asparagus; it’s crunchy and naturally salty from the seawater it grows in, and has a distinct vegetal bitterness. I didn’t blanch the sea asparagus, but I did soak them in water for about an hour to leach out some of the salt. Then I mixed it with tomatoes, sweet onion, and thinly sliced cucumber, plus some lemon juice. 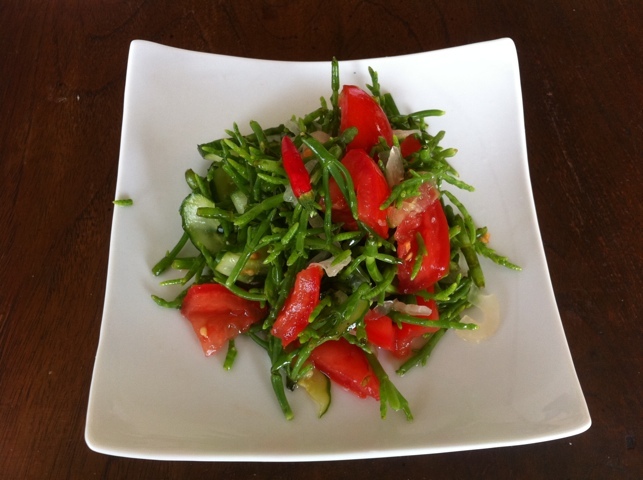 It was still quite salty, even after the soaking, but the crunch from the sea asparagus made it refreshing, like eating a salad by the ocean. And, since it’s Eat Local month in Hawaii, it was nice to make a dish where every ingredient can be sourced locally. Sea asparagus isn’t widely available outside of coastal areas, but if you’re passing through an ocean-front city, look for it in the farmers’ market.